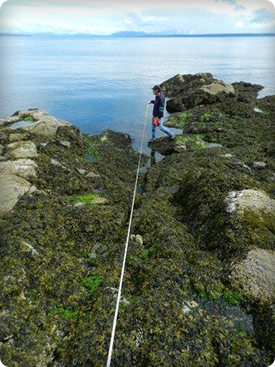 Long-term Ecological Monitoring (LTEM) is a program that began in BC Parks in 2011 for the purposes of tracking the response of ecosystems to climate changes across the province and reporting on the trends in a timely manner to inform management decisions. It is based on a framework that derives its power from consistent small inputs from each management area in the province. This framework avoids the necessity of a large budget which has historically been the downfall of long-term monitoring projects. BC Parks is the perfect system for an ecological monitoring project. There are lands within this system that are relatively free of human disturbances and are located throughout the length and breadth of the province. The trends that are revealed in this work will show the variable responses of different biomes and locations across the province to the rapid climate changes we are increasingly experiencing. There are five biomes directly monitored in the program: alpine, grassland, wetland, forest and intertidal. Each biome has from 1-3 protocols that are carried out by BC Parks staff or by volunteers. Each management area in the province (currently 50) is in the process of establishing two plots: one that measures species change through time (alpine, grassland or intertidal), and one that measures productivity (wetland and forests). Beyond this initial 100 plots, there are opportunities for volunteer groups or individuals to set up plots using the same protocols. All the protocols and a map of all established sites are available through this website.